How much money did I make from an app? Undoubtedly some people are very successful in making money by developing a smartphone app. 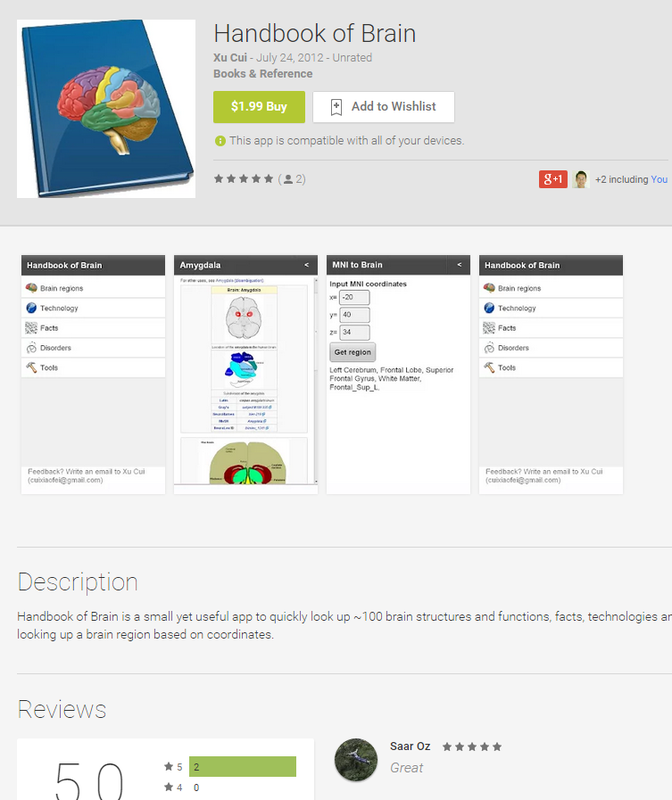 Back in 2012 I developed an app called “Handbook of Brain” which is a collected resources of brain anatomy, function and diseases. I put the app in Google’s app store (Google Play) and priced it as $1.99. I also tried to put it in Apple’s app store but they rejected because the app references wiki a lot. 3 years passed, how much money did I make? 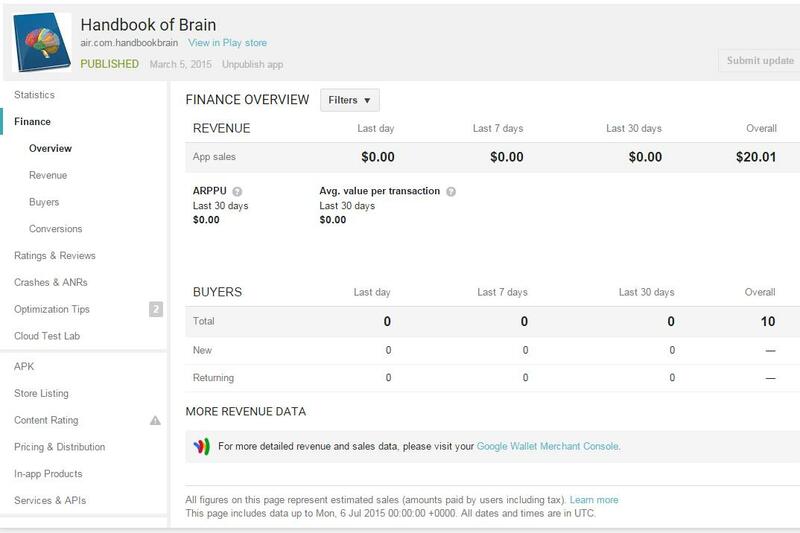 In total there are 10 purchases and the total revenue is $20.01 according to Google. So on average I made $6.7/year, or $0.5/month. 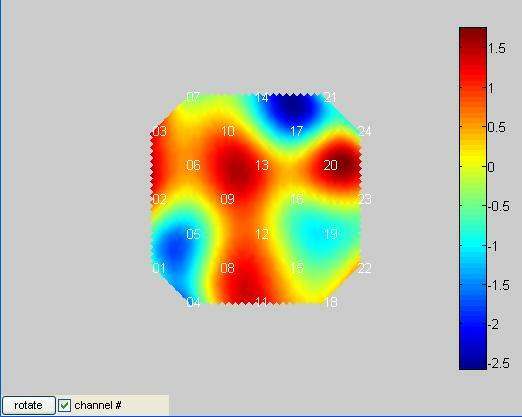 Often you need to view the spatial pattern of activation as in the example below. plotTopoMap allows you to do that. It probably only works for Hitachi devices where the spatial relationship between channels are known. In the above example, the activation pattern of a 24-channel patch is plotted. The white number indicates the channel number. Color indicates the signal intensity. This map is smoothed. You can immediately tell that what areas are activated. You can also rotate the patch in case the orientation is not correct. You can also hide the channel numbers. The 2nd parameter is the patch configuration. It can be ‘4×4′, ‘3×11′, ‘3×5′ or ‘3×3′. And here is the source code of the function. plotTopoMap.m. Type help plotTopoMap in MatLab to see how to use it. Note. This script is adopted from the topo program made by Hitachi. In your AIR application, if you overwrite the application menu, you might find that the keyboard shortcuts (e.g. Cmd-C, V) doesn’t work under Mac. It seems the “Edit” menu in the default application is essential to these functions. So you should at least keep the “Edit” menu if you need to use your own menu. asdoc -source-path .\src -doc-sources . If your AIR application needs to do something (e.g. saving some settings) before quitting, you may listen to the Event.EXITING event, and then preventDefault(), then do something, and finally call NativeApplication.nativeApplication.exit() to quit. But, if you call NativeApplication.nativeApplication.exit() too quickly (e.g. call it right after preventDefault())), your application won’t exit. The solution is to wait some time (e.g. 100 ms) and call this function. If you use mx:WindowedApplication, you won’t have this problem. If you use mx:Application, you may find your application is not visible after launching. Solution: open your application description file (xxxx-app.xml) and change visible property to true. Unable to build a valid certificate chain for the signer. Elegant design. This application drives me to learn AIR. Beautiful design. Buzzword is simply cool!